Ducati 749S any real life experiences please? 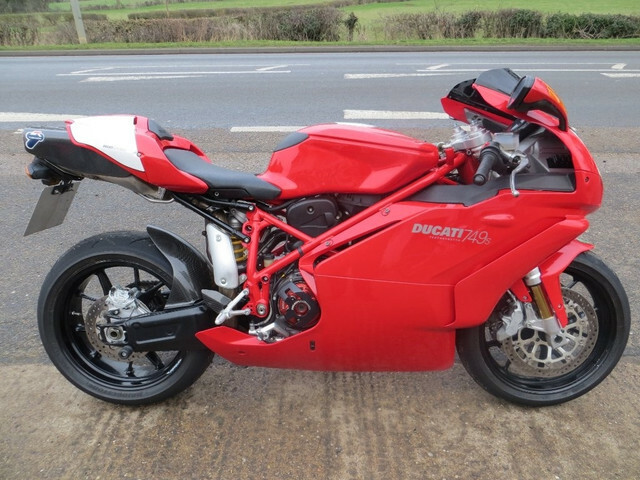 Thread: Ducati 749S any real life experiences please? Whatever negative points are raised, ignore them and just buy it, you’ll not regret it. I’ve had a couple of Ducatis (900ss and 916bp) and remember them with great fondness in spite of their idiosyncrasies. If you’ve only ridden Japanese previously, it’ll take a little getting used to though. Many years ago I had a short ride on a 749 (Burnsey’s actually) and found it far more sophisticated than the 916. Used to have a 748. Very revvy in character and it begged to be ridden hard. I presume the 749 is going to be similar. But for real world use I actually preferred the 996. The torque was just delicious. Happy memories. *Warning. Once you've tried a Duke, you'll be hooked. And whatever you do, don't look at the Performance catalogue! Last edited by Mouse; 9th February 2019 at 15:19. You will not regret it. Should never have sold my 999s. One of the best bikes I have ever owned. Still have a honda SP2. Honda fireblade. Honda CBR600f and a Harley road king classic 1340. Would buy the 999s back in a breath if there was any room left in the garage. Thanks fellas, it will be my first Ducati and my first bike for 10 years! I've just fallen in love with the looks alone. It's a 2005 and only covered just over 5K miles. I've just contacted the dealer for some haggling but I'm now completely sold on the idea. That really is a very pretty thing, not just nice for a bike but a beautiful thing in its own right. This is the bike I am looking at. Im 5'6" and I rode my pals 749 for about 15 miles one summer evening. first impressions its drop dead gorgeous , and even better with its fairing off. so to the ride, imagine sitting on a race horse , head down arse up and feet in the stirrups. even at 5'6" I felt cramped, I was riding a BMW F650GS at the time which felt like an arm chair. I note someone commented on the engine lacking torque , I found the opposite it just rode on a wave of torque. its a long bike and my pal commented he couldn't lift the front wheel , and he comes from an enduro background where they live with the front wheel in the air. The riding position for inflexible me meant with head so far down , my Shoei lid was right down and so my forward vision was affected. My pal said that under 60/70 mph his wrists ached so much due to the lack of wind pressure to take the strain off your wrists. Thanks Steve, always good to get differing options although I seem to have inadvertently bought it now! Good man I deliberated for two years , you have done it. Try it ride it, if you like it keep it , if not flog it you will have scratched the itch and not lost much. Never had a 749, but its bigger sister 999. Bought it when they came out in 2002, it replaced a 916 and was a huge step up both for engine as well as handling and brakes. Unfortunately, my first series model was riddled with technical difficulties (Ducati almost went bankrupt over the quality problems of the initial 749s/999s), but the later models where reliable. Fantastic bikes, you won't regret it. The legendary roar of my Termignonies is still a regular topic when I meet my bike mates these days. Remember my 748 SPS well, sore wrists, bad back but wide grin. Hope you can bend your neck up enough to see the road. I test road the R model many years ago at ‘on yer bike’ between Aylesbury and Bicester. Can’t remember what bike I arrived on at the time. Had owned a 916, 888, 900ss, 750ss, ST4, ST2, 900 monster, 906 Paso and a few others before. So familiar with the breed. Anyway, found the riding position too extreme. I could not bend my head up enough to see the road. Went home and come back with a better fitting helmet. Didn’t help much. Would have one in the hall if I could get away with it. I’ve had an 748SP and a 1098S and would echo the comments above, look and sound epic and for short moments down your favourite country road they are incredible. I’ve a 748; I think they dialled back the screams after those in favour of a more “normal” torque/power balance. OP - 749 is a great bike, no reason not too.